SONOSIM SUMMARY: Through collaboration of several physicians, using a modified Delphi Method, this research was able to create a structured guideline for completing an ultrasound-guided arthrocentesis. The researchers hope that this checklist provides standardization so that needle-insertion accuracy can improve, which in turn will help with the integration of ultrasound guidance into clinical practice. After reaching a final consensus among physicians, the research team suggests further research in the evaluation of checklist effectiveness in a clinical setting. Kunz D, Pariyadath M, Wittler M, et al. Derivation of a performance checklist for ultrasound‐guided arthrocentesis using the modified delphi method. J Ultrasound Med. 2017 Jun;36(6):1147-1152. Arthrocentesis is an important skill for physicians in multiple specialties. Recent studies indicate a superior safety and performance profile for this procedure using ultrasound guidance for needle placement, and improving quality of care requires a valid measurement of competency using this modality. We endeavored to create a validated tool to assess the performance of this procedure using the modified Delphi technique and experts in multiple disciplines across the United States. 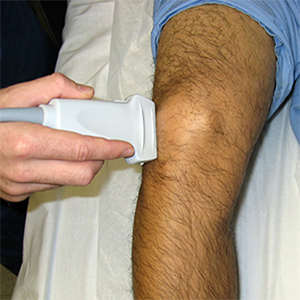 completion of ultrasound-guided arthrocentesis, which demonstrated a Cronbach’s alpha of 0.89, indicating an excellent degree of internal consistency. further validity evidence should be acquired after the tool is used and studied in clinical and simulated contexts.